Objective: The aim of this study was to evaluate the frequency of iron deficiency anemia among the blood donors. Methods: A prospective, single center cross-sectional study was conducted in the Department of Blood Transfusion Services, Shaheed Zulfiqar Ali Bhutto Medical University, Islamabad, Pakistan, from February 2017 to June 2017. A total of 528 blood donors who donated blood without prior screening for hemoglobin levels were enrolled for this study. Blood samples were tested for six hematological and five biochemical parameters including hemoglobin level, red cell count, packed cell volume, mean cell volume, mean cell hemoglobin, mean cell hemoglobin concentration, serum ferritin, iron, total iron binding capacity, transferrin saturation, and unsaturated iron binding capacity. Results: Of 528 blood donors, 251 (47.53%) were first-time donors, 203 (38.44%) had donated twice previously but not in the past 12 months, and 74 (14.01%) were regular donors with minimum three donations per year. All of the donors were males with a mean age of 29.2 years (range = 18–56 years). Of these, the regular donors showed the reduction in mean values of the parameters studied. Conclusion: The blood bank management needs to review the donor selection criteria for donation. Regular voluntary donors should be given an iron supplement to prevent the depletion of iron stores. Iron deficiency is the most widespread form of malnutrition affecting both developing and developed nations. The deficiency affects more people than any other condition, establishing a public health condition of a magnitude equaling to an epidemic. Iron deficiency anemia (IDA) decreases the work capacity of the affected population, resulting in alarming economic consequences and impediments to the national development. According to the World health organization (WHO), in low human development index countries, every second pregnant woman and about 40% of preschool children are estimated to be anemic. IDA is the most common cause of anemia. In 2002, it was considered to be the most important factor contributing to the global burden of disease. Although iron deficiency is considered as the major cause of anemia, there is little data on its occurrence in any given population. The probable reason is that it is difficult to singularly assess to provide adequate information on the iron status and require concurrent values of the red cell indices to have reliable information on the status of iron deficiency. IDA is an important restrictive factor for the number of donations in regular donors. Earlier studies show that the incidence of iron stores depletion increases with an increase in the number of donations. The risk of blood donation and iron deficiency is often not recognized by donors or their doctors. A study from the USA on a huge sample size resulted in very alarming statistics. The study stated that among frequent donors, two-thirds (66%) of the women and almost half (49%) of the men were iron deficient. While conventional screening program based on the level of hemoglobin are adequate to collect a blood unit from a regular donor, it does not indicate the development of progressive iron deficiency over a period through depletion of the body iron. Continuous loss of iron in the body may lead to iron-deficient erythropoiesis and anemia. The estimation of serum ferritin level among the repeat donors is of paramount importance to the safety of the blood donors. The Pakistan blood transfusion system is largely fragmented, individual blood banks work in isolation and based primarily on replacement/family donations. A considerable proportion of blood establishments operate without any formal registration and documentation framework. With a lack of an appropriate donor management system, the donors' questionnaire on medical history, screening for the level of hemoglobin, weight, etc., are not recorded. Sometimes, the donors faint and complain of weakness after the donation  presumably due to a subnormal hemoglobin level. There is a dearth of studies in Pakistan on the prevalence of IDA among the blood donors. The objective of the present study was to assess the incidence of IDA in blood donors using the hematological and biochemical parameters. The prospective, single center, cross-sectional study was conducted in the Department of Blood Transfusion Services, Shaheed Zulfiqar Ali Bhutto Medical University (SZABMU), Islamabad, Pakistan during the 4 months period between February 2017 and June 2017. A total of 528 blood donors had donated blood without prior screening for hemoglobin levels. Almost 500 ml of blood was drawn from each blood donor. The blood sample was taken at the end of the donation procedure for hematological and biochemical workup. Six hematological indices such as hemoglobin (Hb), red blood cells (RBCs) count, Hct value, mean corpuscular volume (MCV), mean corpuscular hemoglobin (MCH), and MCH concentration (MCHC) were included in the study. Similarly, five biochemical iron parameters such as ferritin, iron, total iron binding capacity (TIBC), transferrin saturation, and unsaturated iron binding capacity were included in the study. The WHO hemoglobin thresholds were used to categorize whether an individual is anemic. The hematological parameters were assessed using the XP-300 hematology analyzer (Sysmex Corporation). The biochemical tests (ferritin, unbound iron binding capacity [UIBC], iron) were performed on the Hitachi Modular P800 (Roche Diagnostics) according to the manufacturer's instructions. The ferritin was tested using a human ferritin enzyme immunoassay kit (Roche Diagnostics GmbH, Germany) based on a sandwich enzyme-linked immunosorbent assay principle. UIBC and iron were tested using ferrozine-based kits using colorimetric principle (Roche Diagnostics GmbH, Germany). The kits and samples were refrigerated and brought to room temperature before use. All the test procedures were performed according to the manufacturer's instructions included in the kit. Transferrin saturation and TIBC were calculated as follows: TIBC = UIBC + Iron; Transferrin saturation = Iron/TIBC × 100. The anemia, isolated iron deficiency, and IDA were defined below. Iron-deficiency anemia: hemoglobin <12 g/dL + serum ferritin < 20 ng/mL. Ethical approval of the study was taken from the Ethical Review Board of the SZABMU. The statistical analyses were conducted using SPSS software version 19.0 (IBM Corp., Armonk, NY, USA). Comparative assessment between the study groups was made with the Student's t-test for parametric data and the Mann–Whitney test for nonparametric data. The value of P < 0.05 was considered statistically significant while comparing the data among the groups. The study included 528 blood donors of which 251 (47.53%) were first-time replacement donors, 203 (38.44%) were replacement donors and had donated at most twice previously but not in the past 12 months, and 74 (14.01%) were regular voluntary donors (minimum three donations per year). All of the donors were male and gave informed consent to participate in the study. The mean age of the study participants was 29.2 years (range = 18–56 years). 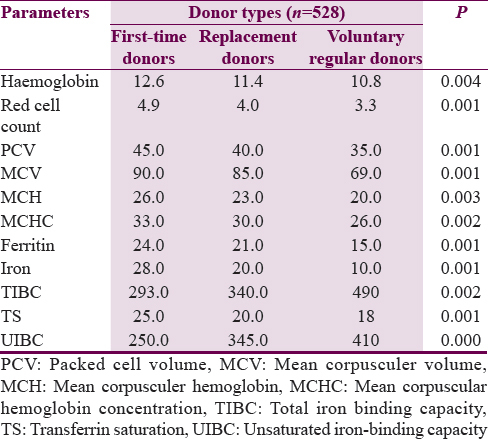 The mean values of all biochemical and hematological parameters were considerably lower in the regular voluntary blood donors than the other two groups of donors [Table 1]. There was no significant association between age of the donors and the iron deficiency, anemia, and IDA. The prevalence of anemia among the donors classified in different categories is shown in [Table 2]. The study echoes back the findings of earlier studies, in that the prevalence of iron deficiency increased with frequent blood donations., In our study, 20.2% and 9.68% had iron deficiency and iron deficiency anemia, respectively. It reports the results observed in male blood donors divided into first-time donors, replacement donors and voluntary regular donors in the Department of Blood Transfusion Services, Shaheed Zulfiqar Ali Bhutto Medical University, Islamabad, Pakistan which would deduce the findings to the entire population of Islamabad. Nevertheless, to the best of our knowledge, it is the first study of its kind which reports information about anemia, isolated iron deficiency, and iron deficiency anemia among blood donors in our region. The study describes an overview of the consequences face by blood donors which could be used to optimize the conditions of recruitment of the blood donors and to minimize the common nutritional disorders in Pakistan. In our study, 20.2% and 9.68% of blood donors had iron deficiency and iron deficiency anemia, respectively [Table 2]. The findings in the present study indicate that iron deficiency among the donors co	rrelates with the frequency of blood donation as has been observed by Lee at al. Increase in a number of blood donations led to increase in the prevalence of iron deficiency. Anemia, isolated iron deficiency, and iron deficiency anemia are rare in first-time donors, but it is more frequently found in replacement donors and voluntary regular donors. Similarly, a US-based study by Cable et al. dividing the blood donors into first-time donors and regular donors show the same result with approximately 10 times higher frequency in blood donors with 10 donations (31%) as compared to the first-time donors (2.6%). The frequency of anemia, isolated iron deficiency, and iron deficiency anemia increases with a number of blood donations. Javadzadeh Shahshahani et al. found an occurrence of 26.5% among regular blood donors and none (0%) in first-time donors. Goldman et al. also found elevated prevalence of iron deficiency anemia in first-time donors and those with less than two donations with the increase of 0.2%–0.8% in men. Salvin et al. has also confirmed the prevalence of iron deficiency anemia in Australia. This iron deficiency anemia was 26.4% in females with at least one donation in the past one year which elevated with frequent blood donations and decreased with age. While in male donors, the prevalence of iron deficient anemia was 6.3% without the influence of age factor. Among the two categories of the donors, the regular donors were found to be more affected by iron deficiency as shown by the reduction in mean values of both hematological and biochemical iron parameters. The blood bank management needs to review the screening criteria used at the time of donation. Regular voluntary donors may be given iron supplementation to prevent depletion of iron stores. One key recommendation is to include serum ferritin measurement to assess regular blood donors. World Health Organisation. Micronutrient deficiencies: Iron deficiency anemia. Available from http://www.who.int/nutrition/topics/ida/en/. [Last accessed on 2017 Jul 20]. Anand T, Rahi M, Sharma P, Ingle GK. Issues in prevention of iron deficiency anemia in India. Nutrition 2014;30:764-70. World Health Organization. The World Health Report 2002: Reducing risks, promoting healthy life. Geneva: World Health Organization; 2002. Milman N, Kirchhoff M. Influence of blood donation on iron stores assessed by serum ferritin and haemoglobin in a population survey of 1433 Danish males. Eur J Haematol 1991;47:134-9. Finch CA, Cook JD, Labbe RF, Culala M. Effect of blood donation on iron stores as evaluated by serum ferritin. Blood 1977;50:441-7. Simon TL. Iron, iron everywhere but not enough to donate. Transfusion 2002;42:664. Worwood M. Laboratory determination of iron status. In: Brock JH, Halliday JW, Pippard LW, editors. Iron Metabolism in Health and Disease. London: W.B. Saunders; 1994. p. 449-76. National Committee for Clinical Laboratory Standards (NCCLS) Approved Standard. Reference and Selected Procedures for the Quantitative Determination of Haemoglobin in Blood. 3rd ed. Villanova, PA: NCCLS; 2000. Javadzadeh Shahshahani H, Attar M, Taher Yavari M. A study of the prevalence of iron deficiency and its related factors in blood donors of Yazd, Iran, 2003. Transfus Med 2005;15:287-93. Cable RG, Glynn SA, Kiss JE, Mast AE, Steele WR, Murphy EL, et al. Iron deficiency in blood donors: Analysis of enrollment data from the REDS-II donor iron status evaluation (RISE) study. Transfusion 2011;51:511-22. Milman N, Søndergaard M. Iron stores in male blood donors evaluated by serum ferritin. Transfusion 1984;24:464-8. Kayani IS, Ishtiaq M, Waheed U, Zaheer HA. Adverse reactions in blood donors in a tertiary care teaching hospital blood bank of Islamabad. J Islamabad Med Dent Coll 2016;5:81-3. Iron Deficiency Anaemia: Assessment, Prevention, and Control. A Guide for Programme Managers. (WHO/NHD/01.3). Geneva: World Health Organization; 2001. Mittal R, Marwaha N, Basu S, Mohan H, Ravi Kumar A. Evaluation of iron stores in blood donors by serum ferritin. Indian J Med Res 2006;124:641-6. Brittenham GM. Disorders of iron metabolism, deficiency and overload. In: Hoffman R, Benz E, Silberstein L, Heslop H, Weitz J, Anastasi J, editors. Hematology: Basic Principles and Practice. New York: Churchill Livingstone;1991. p. 327-49. Cançado RD, Chiattone CS, Alonso FF, Langhi Júnior DM, Alves Rde C. Iron deficiency in blood donors. Sao Paulo Med J 2001;119:132-4. Simon TL, Garry PJ, Hooper EM. Iron stores in blood donors. JAMA 1981;245:2038-43. Yousefinejad V, Darvishi N, Arabzadeh M, Soori M, Magsudlu M, Shafiayan M, et al. The evaluation of iron deficiency and anemia in male blood donors with other related factors. Asian J Transfus Sci 2010;4:123-7. Jeremiah ZA, Koate BB. Anaemia, iron deficiency and iron deficiency anaemia among blood donors in Port Harcourt, Nigeria. Blood Transfus 2010;8:113-7. Lee CK, Wong HK, Hong J, Leung JN, Tsoi WC, Lin CK, et al. Astudy of the predonation hemoglobin and iron status among Hong Kong Chinese blood donors. Transfusion 2013;53:322-7. Goldman M, Uzicanin S, Scalia V, O'Brien SF. Iron deficiency in Canadian blood donors. Transfusion 2014;54:775-9. Salvin HE, Pasricha SR, Marks DC, Speedy J. Iron deficiency in blood donors: A national cross-sectional study. Transfusion 2014;54:2434-44.